He had waited 599 days, made a controversial decision to swap clubs that was widely questioned in the media, and spent the first three weeks of the season among the emergencies, but Brayden Preuss was all smiles last night. And rightly so. He had made an eye-catching debut for Melbourne against Sydney at the SCG, and after an important role in a critical 22-point Demons win he was given an overwhelming commendation by his skipper. “He (Preuss) is going to be a great addition for us going forward … there’s no doubt about it,” said Nathan Jones. Preuss had been one of the big talking points of the AFL summer when, after three years and eight games at North Melbourne, he quit the Kangaroos to join the Demons. He didn’t play an AFL game in 2018 and decided he needed a fresh start. The big question was why the even bigger Queenslander would leave North, where he was understudy to 30-year-old Todd Goldstein, to join Melbourne as understudy to 26-year-old Max Gawn, the best ruckman in the competition. The critics questioned whether 206cm Preuss and 208cm Gawn could play together, and whether Preuss was just there in case of injury to the match-winning Gawn. And when Preuss was left out of the Melbourne side in the first three rounds he could have been excused for doubting his decision. He got his chance last night when the 2018 preliminary finalists, coming off a disastrous 0-3 start to the season, travelled to the SCG to take on the Swans in the knowledge that it would be a long way back if they lost again. It was a huge night for 23-year-old Preuss, a late convert to AFL from Townsville via the Gold Coast Suns Academy who was a Rookie Draft pick by North in 2015. His eighth and last game for North was on 20 August 2017. He would have been 600 days in the wilderness today. He’d played Rounds one to four and rounds 19to 22 in 2017 for 71 disposals, 5 goals, 180 ruck hit-outs, 23 tackles and 12 contested marks. And one win – against Melbourne. Although there was a lot of hype about his potential at Arden Street, and he had two years of a contract to run, he decided he wanted out. And when the opportunity to work on his craft under Gawn came along – initiated by Gawn – he shunned interest from other clubs and requested a trade to Melbourne. Without too much fuss he was swapped late in the trade period by Melbourne to North for Dom Tyson. When Tyson played the first three games of the season for North as Preuss watched on the critics may have questioned the wisdom of the deal, but not after last night. Not only did Preuss impress in his first outing in blue and red in their first win of the season but Tyson was dropped by the win-less Kangaroos. Preuss was presented with his jumper pre-game by former Melbourne captain Todd Viney. And it wasn’t just any old jumper. It was #21. Among those who have worn it for the proud foundation club of the VFL/AFL have been 258-game wingman Steven Febey, who sits sixth on the club’s all-time games list, and Don Cordner, an all-time great who played 166 games from 1941-50., was a 1941 and ’48 premiership player, club champion in 1943, captain 1948-49 and first ruck in the Melbourne Team of the Century. Preuss inherited #21 from Cam Pederson, who retired at the end of last season after 64 games for the Dees. Having never played at the SCG, and never played against the Sydney Swans, Preuss made an immediate impact. The game was only seven minutes old when he took the ball out of the ruck in a boundary throw-in and snapped a fantastic goal over his shoulder. He was mobbed by his new teammates. Sixteen minutes later he took a strong contested mark and banged home a thumping kick from outside 50m. He had two of the Demons’ first three goals, and had equalled his career-best. At quarter-time he had four disposals, one contested mark, two hit-outs, two clearances and two goals, and, with 112m gained, ranked fifth in his team. Only four Melbourne played had more disposals, and Preuss had their only contested mark. Significantly, although Sydney led by two goals, hit-outs favored Melbourne 18-2. The Gawn-Preuss combination had made a promising start. Preuss went down into the dressing rooms at quarter-time for treatment to a bruised shoulder and missed the first 20 minutes of the second quarter, but returned shortly before halftime and played out the rest of the match without any apparent inconvenience. He finished with 11 disposals, five marks, two goals, one tackle, three clearances and 184m gained. Collectively, Gawn and Preuss won the hit-outs 73-13. Jones was convinced. Asked specifically about Preuss’ contribution, he said: “It was unreal .. his snap out of the ruck was a great start, and I thought his addition added some versatility for us,” he said. “We were able to throw some stuff around and it allowed some freedom for Tommy Mac (McDonald) and Sammy Weideman as well because Preussy is such a big lad and draws the footy. “He creates a contest and that allows the other boys to get up the ground a bit and use their legs and run. 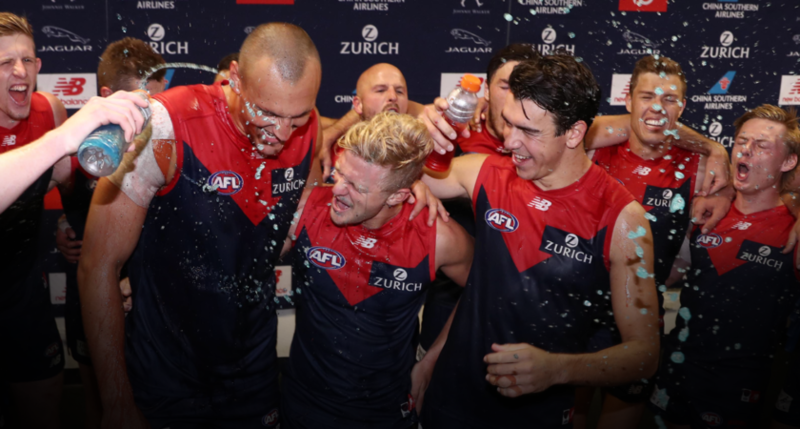 Preuss, who has already built a close working relationship with Gawn, found himself sharing a Gatorade shower from teammates in the rooms after the game with fellow Queenslander Corey Wagner, who, in his third game for his second club, also had his first win. Ironically, Wagner and Preuss had been teammates at North in 2016-17, and last night found themselves in a three-man Queensland contingent in the Demons side with Corey’s brother Josh. Josh Wagner had 16 disposals playing in defence, while Corey Wagner had 10 disposals on the wing, while fellow Queenslander Aliir Aliir was among Sydney’s best with 18 disposals and seven marks in defence. With Melbourne to play St.Kilda, Richmond and Hawthorn at the MCG in the next three weeks, followed by Gold Coast at Metricon, the three Queenslanders will look to consolidate their place in the top side. In Queensland news to come out of other selections last night, Bailey Scott will be rested after three impressive games for North, and Tom Hickey will play for West Coast in his first derby against Fremantle. Josh Smith is an emergency.